Bogotà (Agenzia Fides) - Thousands of people took to the streets in several cities of Colombia, on March 18 and 19, to demonstrate in favor of the "Special Justice for Peace" (JEP the abbreviation in Spanish), asking President Iván Duque to respect the terms of the agreement signed in 2016 between the then president Juan Manuel Santos and FARC (Revolutionary Armed Forces of Colombia). 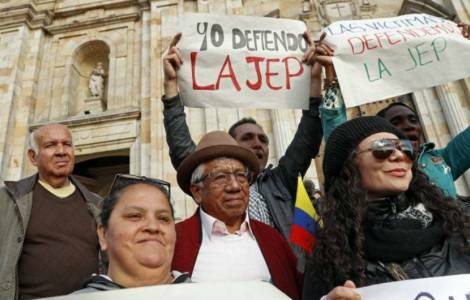 Duque calls for the law applied by the JEP to include severe prison sentences and compensation for victims of war crimes and human rights violations, which was not foreseen in the original agreement, following which some 13,000 FARC members had abandoned weapons and formed a political party. However, President Duque does not have a solid majority in the Senate or the House of Representatives, so his intention to change the agreement, one of the main issues of the election campaign, could be rejected. Colombia is still divided among those who approve the entry of FARC as a political group, after the signing of the peace agreement, and the more conservative sectors, which instead demand the detention of former combatants, for participating in the violent confrontation that caused the death of 260,000 people in over 50 years. While in the capital the main topic of discussion is this, in other places in Colombia the violence of armed groups continues, to the point of forcing Archbishop César Alcides Balbín Tamayo, Bishop of the Diocese of Caldas en Antioquia, to order the immediate transfer of a priest, Fr Raúl Mejía Valencia, of the parish of San Antonio de Padua, in the municipality of Armenia Mantequilla. In the statement of the diocese sent to Fides, it is confirmed that the threats to the priest were also verified by the local authorities. Mgr. Balbín Tamayo "condemns the threats against life, integrity and property, not only of the priest, but of all the inhabitants of that area of Antioquia, who live under this scourge". The statement ends with the request to the authorities for an effective presence in this area.